Graduation Cap and Gown, Academic Regalia and Doctoral Regalia such as the doctoral gown, doctoral tam, PhD gown, doctoral hood and PhD hood. To use, first choose your gown fabric, from the drop down menu. Or leave 'as is' for standard black deluxe Pilgrim cloth. Next, choose your degree for the velvet color for your hood. Note that the correct color for all Ph.D. degrees is Ph.D. Blue, regardless of specialty or discipline. If you want the same color velvet (as your hood) used on your gown, leave the next check box checked. If you want a different color velvet for the front of your gown, uncheck, and select the velvet for 'Front Panel of Gown'. If you want the same velvet on your sleeves, leave the next box checked. Otherwise uncheck and select a different sleeve velvet color. Note: most people keep this box checked, as normally people use the same color velvet on their sleeves as on the front of their gown. Finally select your piping color. 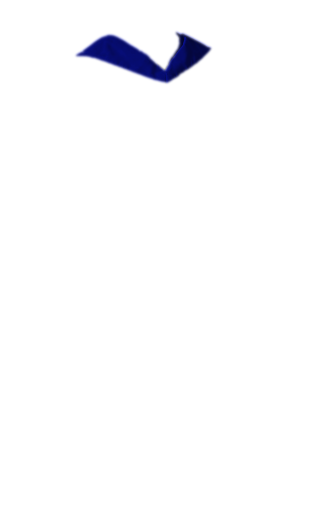 Most people use Gold, but Silver and Light Blue are also available. Price for customized gown is $290.00 plus whichever options you selected above. 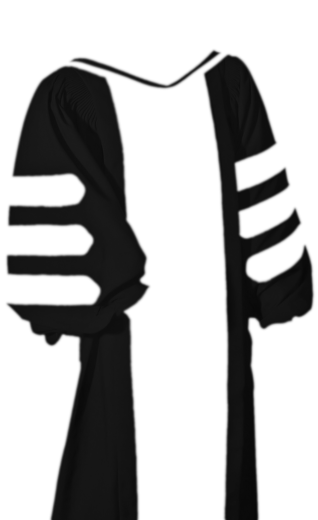 The academic hood is comprised of three parts: a fabric shell (usually black), "degree velvet" and "school lining". In most cases, the important factors are the velvet and the lining. The velvet of the doctoral hood represents your degree. The lining represents the school where you obtained your degree. 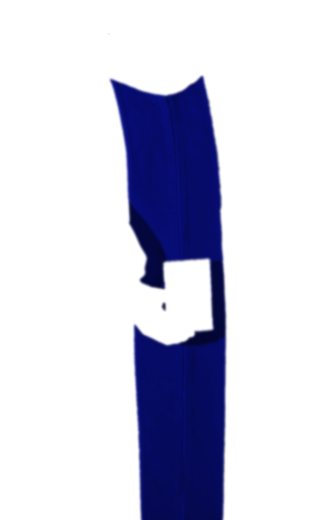 For a Ph.D. hood, the degree velvet is Rich Royal Blue, or as we call it, "PhD Blue", regardless of the field or specialty of the Ph.D. In addition to the degree colors, each school generally has its own colors. These "school colors" are represented by the colors of the satin lining in the back of the hood. As each academic hood is custom-made according to your school colors, degree colors, and type of degree (BA, MA, or Ph.D.), we ask that you give us about +/- 8 weeks to process your order, especially during the graduation season. What if you don't have that much time to wait? No problem -- ask us about our free loaner hood program! Notwithstanding the discipline velvet colors listed on the top paragraph, the correct velvet color for all Ph.D. hoods is dark blue, representing the mastery of the discipline of scholarship attested to by the awarding of the Ph.D.
On the other hand, the correct velvet color for all non-Ph.D. doctorate holders (as well as Masters and Bachelors) would be that of their particular field. That means that while a Doctor of Education (Ed.D.) would receive light blue velvet, a Ph.D. in English would receive the dark blue velvet. Similarly a non-Ph.D. Doctor of Science would receive Gold velvet, but a Ph.D. in Science would receive the dark Blue Velvet. A non-Ph.D. 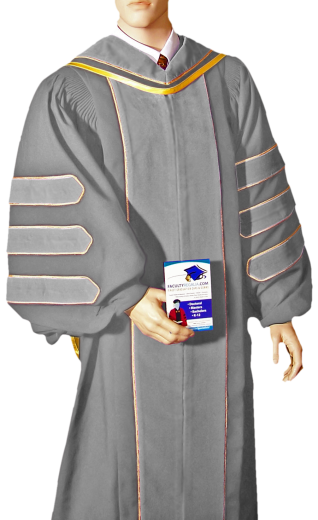 Doctor of Engineering would receive Orange Velvet, but a Ph.D. in Engineering would each receive the dark blue velvet. Gold piping is also an option for doctors wanting to "dress up" their gown and/or hood. 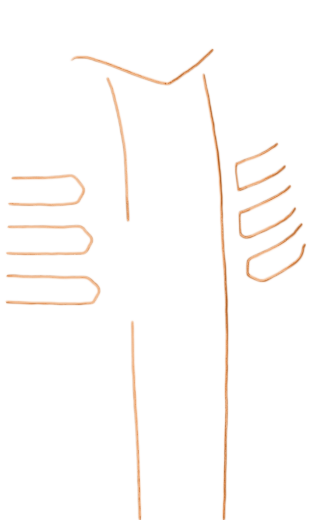 Piping is often added to customized doctoral hoods to match doctoral gowns with piping. 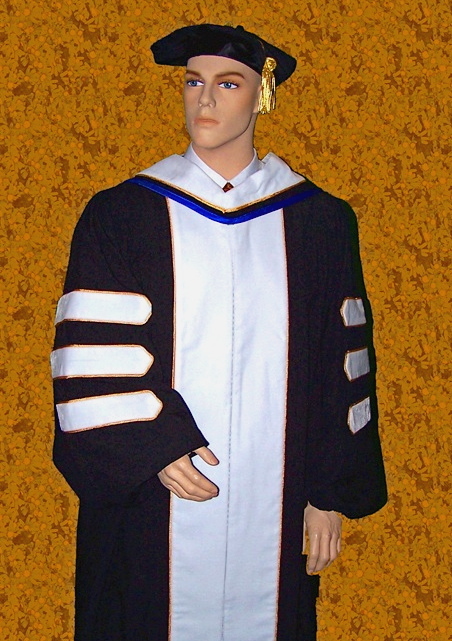 We recommend the Deluxe hood for Deluxe and Faculty quality gowns and the Economy doctor's hood for the souvenir gown. To "top it off" you have the choice of a Doctoral Tam, or a Mortarboard for your academic cap. Although not required, most faculty members who have doctorates purchase doctoral tams, in place of mortarboards, to differentiate themselves from students and non-doctors. Doctoral tams are available in your choice of four, six, or eight cornersand in your choice of a gold silky tassel or gold metallic tassel, or with plain tassels. If you elect to dress your gown or hood with Gold Piping, then we strongly recommend the Gold Bullion Tassel since it matches better with the gown and hood piping than the silky tassel. We keep Doctoral Tams in stock in traditional Black velvet, and can also make them in your choice of colors such as Red or Blue. Extremely tall and thin people may look better with the eight-sided tam since it tends to look more round, and help "fill a person out", while very short stocky people may look better with a four-sided tam since it is sharper and thus makes the person look "less round". The cost of the four, six, or eight-sided Tams are $92.00 with the Bullion Tassel or $78.50 with the silky tassel. 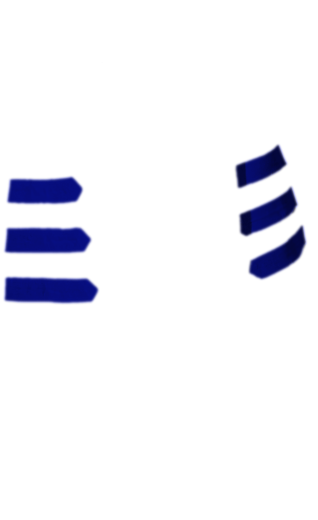 If purchasing without a gown, the price of the four and six-sided Tam is the same, but the eight-sided Tam is $20.00 extra. Tams in Blue or Red or other non-Black velvet colors are $20.00 extra. When ordering your Doctoral Tam, be sure to indicate your hat size or your head size. Using a tape, measure the circumference of your head about an inch over your eyebrow. The size should be in the neighborhood of 22 to 23 1/2 inches. It should be snug but not too tight. Round size to nearest quarter inch. If you are between sizes, err to the larger quarter inch. A cap size would be something like 6 7/8, 7 1/4, 7 3/8, etc.